the march/rally was huge. estimates put it over 100,000 people. we didn’t head towards city hall at all, but there were people streaming down broadway, spring, and even main street (and probably hill street). i put a few more photos up. 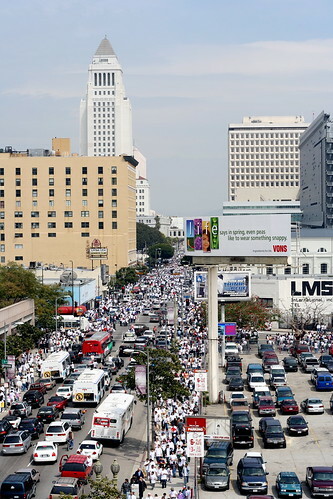 you can also check out dave bullock’s photos of the march. we ran into a couple (british or australian, my bet would be australian) in pershing square who had no idea what they had gotten themselves into when they decided to visit downtown today. i wonder how the los angeles conservancy’s walking tours went today. someone needs to explain to me what the political value of waving around the flag of mexico or nicaragua is at a march like this.